Nimatopaal AB, Candeco Cenfektyr and Frima Vafler A / S are all subsidiaries of the Norwegian company Idun Industri A/S. All companies have been exporting to countries in Europe. OY Roberts is a distributor of NICs products in Finland. Nimatopaal is since 2005 included in the Idungroup. The company has for almost three decades had as main business to supply the market with icecream accessories. In the Nicgroup Nimatopaal is acting on the Swedish market. Here are the NICs central warehouse and head office. At current Nimatopaal has seven employees, as well as additional resources during peak periods. Idun Industri is supplying ingredients to bakeries, pastry shops and food industries. The company also offers a wide range of products for the icecream industry. To the grocery stores Idun sell fresh yeast and dry yeast, marzipan and bread mixes. Idun Industri has through acquisitions in Sweden and Denmark established a leading market position in Scandinavia in the icecream accessories for ice cream shops. Candeco Confektyr is found in Sweden and manufacture vermicelli for both Nic as industrial customers. In addition to sprinkles to ice cream has Candeco also has many other strings to their bow when it comes to sweets. Frima Vafler is responsible for the Danish market as well as for production and sourcing of cones and waffles. Frima also has a producing unit, JB-Våfflan in Strömsund, a subsidiary. Idun Industri is part of Orkla Food Ingredients (OFI), which is part of Orkla Brands and owned by Orkla. Orkla Food Ingredients (OFI) is today the leading player in bakery ingredients in the Nordic countries, and is a member of the five leading players in Europe. OFI is composed of 29 companies in 15 countries. The largest segment is bakeries and bakery industry. Other key segments are groceries and catering. 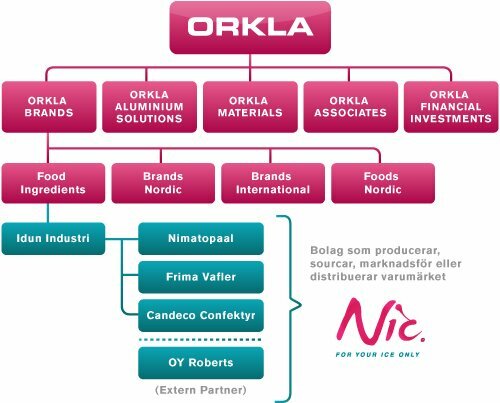 Orkla has a field of activity within branded, aluminum solutions, renewable energy, materials and financial investments. Group turnover is approximately NOK 66 billion and the number of employees is 30 000. Orkla operates in more than 40 countries.